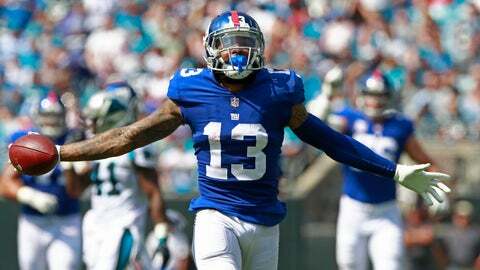 CHARLOTTE, N.C. (AP) — Odell Beckham Jr. said he spoke with his New York Giants teammates hours before Sunday’s 33-31 loss to the Carolina Panthers to clear the air over comments he made last week. But the 25-year-old receiver was quick to add he doesn’t regret anything he said. “It took that for us to come together as a team like we did today, I can take that every single time,” Beckham said. The Giants lost on a 63-yard field goal by Carolina’s Graham Gano with 1 second remaining after battling back to erase an 11-point fourth-quarter deficit. Beckham had easily his best game of the season Sunday with eight catches for 131 yards and a touchdown. He also threw a 57-yard touchdown pass to running back Saquon Barkley after receiving a lateral from Manning. The Giants had completed only two passes of 30 yards or more this season entering Sunday, and they have only nine passes of 20 yards or greater. They had six pass plays of longer than 20 yards against the Panthers, including Beckham’s 33-yard touchdown catch from Manning. Beckham said he texted coach Pat Shurmur to ask if he could address his teammates. Shurmur said he addressed the issue with Beckham and the team — and made it clear he wants to get past it all. Beckham said he felt the need to speak up last week because he’s trying to be a leader.